The Carter MultiRest is compatible with lathe swing sizes from mini up to 20" with no additional hardware required. The base of the MultiRest has independently adjustable spacer blocks providing a secure fit on lathe beds with way sizes from 1" to 4-1/2" in width. 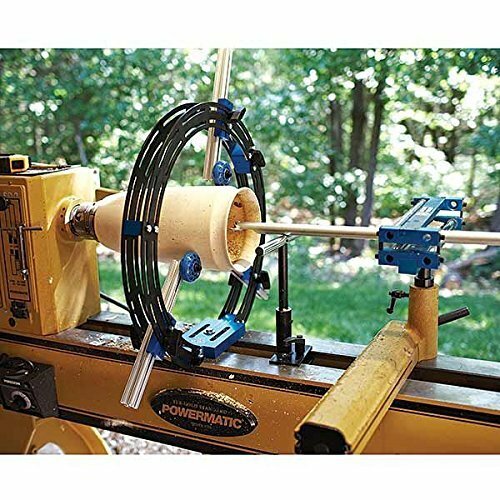 The unique two-piece design allows the MultiRest to be quickly opened while leaving the base firmly attached to the lathe bed, providing easy access for mounting, sanding, and demounting turnings. Another benefit of the MultiRest is the ability to remove the larger section which allows the smaller section to be used as a bowl rest. The MultiRest is equipped with bearing mounted, non-marring urethane wheels which have a rigid internal ring to prevent sidewall flex, thus providing excellent support.